December « 2014 « Geekorner-Geekulture. Fall 2014 is over, and I’ve barely watched any series, roughly 7. But enough with that, the season that just ended was apparently pretty great, but we need to look ahead! Winter 2015 begins officially tomorrow, with Tsukimonogatari’s release. Most everything else begins on January 4th, which is next Sunday. This season is a bit sparse, but continuations (Shirobako, Parasyte) and returning shows (Durarara! !, JoJo) pick up some of the slack. As always, in these posts I cover shows I plan to follow, or have thoughts on why I will not follow them, or considered following and decided not to. As always, I try to strike a balance between giving you enough information on the show, and telling you why I think it is or isn’t worth watching. Shows ordered by day, and by expectation within the day, since I might pick or not pick a show up based on how busy that day is. That’s only sensible. Most of the information about the shows can be had from RandomCuriosity’s page, the helpful Neregate Chart, and what I’ve happened to see on various sites, such as The Cart Driver. Check them out if you want more information, or information on shows I didn’t cover (such as follow-ups to shows I don’t watch). Junketsu no Maria / Maria the Virgin Witch – The Hundred Years’ War. Maria decides to stop the war by summoning a succubus and incubus to sleep the armies’ commander into a happy stupor. Heaven intervenes and decrees Maria will lose her powers if she were to lose her virginity. Manga-based. I am often tired of “non-humor gags” that proliferate through anime, but I actually laugh at many such gags when they appear. Speculative pick of the season for me. Of special note is the director behind the show is Taniguchi Goro, knows as the director behind Code Geass and Planetes. Not exactly known for comedy, but a solid pick. Interest Rating: 1.5/3. I’m not a huge fan of anime comedies, but I do enjoy them when they work. It seems the combination of humor and comedy might work out for me. Hope springs eternal. 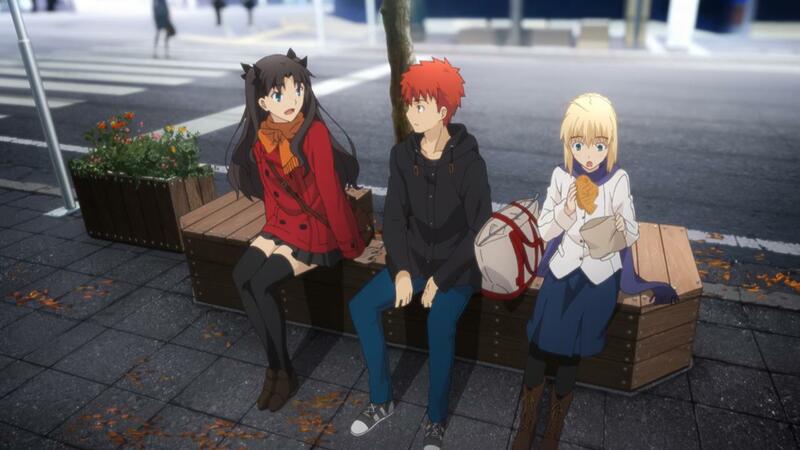 Fate/Stay Night: Unlimited Blade Works Episode 12 (Finale) – Fun Times. Dull Times. Conflict. This episode came out at 3:30 AM. I was awake, but trying to get my sleep schedule even nominally under control, and being as it was a double feature, I decided to go to sleep. With that out of the way, last episode had a lot of gag moments, funny faces, and tsundere-Rin, which was enjoyable but empty calories, and another session of “Shirou discusses philosophy with Rin/Archer”, which was much meatier, but didn’t entirely add up in terms of internal logic. I expect a lot of sweet action this episode, so let’s go. Screenshot album 1 (up to 17:32), screenshot album 2 (up to 35:01), screenshot album 3 – imgur has a 150 image limit per upload. Joint album, but with reverse image order. 1) “The bread I bought is gone and has been replaced by 300 yen.” – TAIGA!!! !